Through existing agreements and partnerships, CVIP utilizes local services with specific expertise in order to minimize our total cost offering and to maximize the level of available experience that is necessary for your particular need, thus offering the most flexible and cost effective approach. Efficient use of local facilities allows CVIP to meet virtually all types of rolling, forming, machining and finishing of most specialized shapes or configurations. CVIP has a fully compliant OSHA sandblasting and painting facility along with experienced personnel who can provide mechanically polished surface finishes to 32Ra microinches or better. Waterjet 10'-0" x 16'-4" with 24" of height travel. 5-axis. 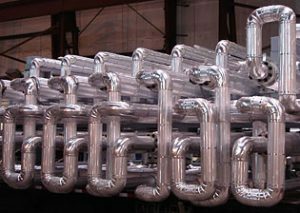 Complete welding procedure developments and welder qualifications to meet a wide range of customer needs from seal welding of materials only a few thousandths of an inch thick to narrow gap welding of heavy wall pipe or forgings. CVIP welders are qualified in a broad range of materials such as carbon steel, stainless steel, aluminum, monel, low alloy steel and nickel-steel alloys such as nickel, hastelloy and inconel. 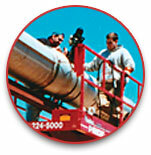 Orbital welding capabilities are available up to 3" OD tubing. Quality systems meet American Society of Mechanical Engineers (ASME) Section VIII, Division 1 standards for pressure vessels. CVIP maintains current "U", "R" and "UM" stamps and the Department of Transportation’s (DOT) certificate for re-certification of over-the-road pressure containing vessels. Qualified technicians perform a broad range of Non-Destructive Testing (NDT) services that include dye penetrant, magnetic particle, ultrasonic, helium leak detection to 1 x 10-9 std cc/sec, hydrostatic to 10,000 psig, radiographic examination, positive material identification and precise laser measurement and alignment verifications. Existing CVIP procedures are reviewed for customer compliance or new procedures are established that specifically meet the job requirement specifications. Areas addressed are internal and external surface preparations, acceptable cleaning fluids, visual inspection points, white cloth and black light examination, particle or moisture verification testing and proper sealing to prevent further contamination. Utilization of individuals specializing in instrument and control system integration design, selection and specification generations, wiring or control panel layouts, full panel assembly and wire routing from all instrument devices to common panel(s), heat tracing, wiring continuity checks or instrument function testing. CVIP also has in-house personnel experienced in installing most types of mechanical insulation systems for either hot or cold applications. CVIP maintains a fully equipped service rig consisting of one dual cab truck and trailer that is utilized for most types of site installations, repairs or start-up assistance. Please contact CVIP for your specific needs.